At the end of each year, WordPress sends an email containing an ‘Annual Report’ with some info regarding your site. Here are some interesting stats from 2015 re my WordPress site. In 2015, there were 234 new posts on my site, growing the total archive of my WordPress site to 558 posts. It’s interesting to see how people from my site. Allen VK3ARH (formerly VK3HRA) has an active blog list on the parksnpeaks site, and clearly from the list below, this is bringing in visitors. I have a visitor globe on my WordPress site and it never ceases to amaze me, who visits my site. And it is always pleasing when people who have visited your site, leave a comment. Sadly, this doesn’t happen a lot. Chris VK4FR and John VK5BJE are my top commenters. There are a lot of visitors, but not a lot of those who take the time to leave a message. Hope you found the stats interesting. I have now qualified for the VKFF Hunter Honour Roll 350 certificate, for working 350 different VKFF references. Thanks to all the activators for their efforts of getting out and about into the field. Yesterday morning I ventured over to Mount Gawler, VK5/ SE-013, near Kersbrook, to activate the summit for the Summits on the Air (SOTA) program, using the special call of AX5PAS for Australia Day. We can only use the special AX prefix three times a year here in Australia, so I almost always try to use it on those occasions. I have activated Mount Gawler summit a number of times in the past, as it is a very easy summit to access, and just a short 45 minute drive from home through the Adelaide Hills. There is a trig point at the summit, but this is located on private property. Contact details for Noel and Anne, the property owners, can be located within the SOTA database. They are very friendly people and very supportive of our hobby. Please do NOT enter onto their land without permission. If you don’t have prior permission, the roadway out the front of the property is still well and truly within the SOTA activation zone. Above:- Map showing the location of Mt Gawler. Image courtesy of Location SA Map Viewer. Despite the fact that the summit is called Mount Gawler, it is situated quite some distance from the town of Gawler, which is located north of Adelaide (and about 26 km north of the summit). Mount Gawler is situated about 32 kms north east of Adelaide and about 8 kms west of the town of Kersbrook. The summit is 541 metres above sea level and is worth two (2) SOTA points. Above:- Mount Gawler summit contour map. Courtesy of Location SA Map Viewer. As I drove down Checker Hill Road, the summit soon came into view. Checker Hill Road is used as part of the King of the Mountain hill climb for the Tour Down Under cycling event. It is much easier driving down this hill, than cycling up it! Mount Gawler is situated in the fire ravaged area of the Sampson Flat fire from January 2015. A major bushfire burnt in this area for around 8 days, blackening more than 112,500 hectares (31,00 acres) and destroying 38 houses. Fortunately Noel and Anne’s home survived (but only just). I last activated Mount Gawler in March 2015 with Tom VK5FTRG, and I was pleasantly surprised to see a large amount of regrowth of the trees on the fireground. I then reached Noel and Anne’s property and drove in through the front gate which they had kindly left open for me. I had spoken with Anne a few days before, seeking permission to operate from the trig point. I was set up and ready to go by around 2210 UTC (8.40 a.m. South Australian local time). I set up at the trig point, using a large moss rock as a chair, and another moss rock to rest the Yaesu FT-857d on. It was a beautiful morning, with an expected top temperature for the day of 33 degrees C. There was quite a bit of cloud cover, so that was screening me from the sun, with the temperature sitting on a very comfortable 21 degrees C, with a slight breeze. For this activation, I ran about 30 watts, the 20m/40m linked dipole, and the 15m dipole, supported on a 7 metre heavy duty telescopic squid pole. Above:- Aerial image showing my operating spot. The dirt road is Mount Gawler Road. The fire damage is still evident. Image courtesy of Location SA Map Viewer. There are some very nice views of the northern suburbs of Adelaide and beyond from the summit, including the Salt Crystalisation Plains at St Kilda. I commenced calling CQ on 7.090 and this was soon answered by Andrew AX3BQ with a beautiful 5/9 signal from Melbourne. This was followed by Peter VK3FPSR (5/9), Ron AX3AFW (5/9), and then Scott VK7NWT (5/9). I was happy…I had qualified the summit. My 7th contact for the activation was with Greg VK5LG who lives nearby in the Adelaide Hills. As you would expect, Greg had a very strong signal, and indicated that he might come up and pay me a visit. Unfortunately this was short lived, as it was quashed by Greg’s ‘Minister of the Interior’ as there were other things planned. Band conditions on 40m were less than ideal. I would describe them as average. And although there were 5/9 signals coming in from the eastern seaboard, signals were down. Most callers were from VK3, followed by VK2 and VK4. Sadly, there were very few VK5 SOTA chasers. It was pleasing to see a number of hams using the AX prefix to celebrate Australia Day. This included Marcus AX3TST/5 who was running his double sideband kit radio, and sounding great. I worked a total of 32 stations 0n 40m SSB, before heading over to 20m, where I commenced calling CQ on 14.310. This was answered by Mr. Reliable, Rick VK4RF/VK4HA with a booming 5/9 signal from Burpengary in Queensland. Whilst Rick and I were talking, a USA station came up on the frequency. Despite the fact that he was very light, I decided to QSY down to 14.305, where I started calling CQ again. My CQ call was answered by Tony VK2VIC, followed by Steve VK7CW and then Mark VK1EM. But conditions on 20m were rather poor, with a lot of QSB present on most signals. This was particularly noticeable with the VK3 callers. They were very strong one moment, and then gone the next. I worked a further 5 stations from Vk1, VK2 and VK3, before trying my luck on 15m. I headed for 21.244 and started calling CQ and this was almost immediately answered by Steve VK5SFA with a 5/9 ++ signal to Mount Gawler. This was followed by Cliff VK2NP who was also 5/9, and then Stuart VK5STU. Stuart informed me that he and Nigel VK5NIG would venture up to Mount Gawler to say g’day and do a little SOTA work themselves. The 15m band seemed to behaving itself a bit better than 20m, with some good signals coming in from all across Australia (VK1, VK2, VK4, VK5, and VK6). I worked a further 14 stations after Stuart, including a contact with Phil NS7P in Oregon, USA. Phil was quite weak to me (5/3) and I was even weaker (3/3), but we made a successful contact. Looking at Phil’s QRZ.com page, it is evident that he is a SOTA enthusiast. Another USA station, I think a W7, was also calling me. But sadly, we just couldn’t quite make it. I also spoke with Gerard AX2IO who was activating SOTA peak Bulgo Hill VK2/ IL-017 which is located within the Royal National Park VKFF-0362. Gerard was my first Summit to Summit contact for this activation (5/7 both ways). I just snuck in Ian VK5CZ from Clare prior to the UTC rollover, and worked Ian again for the new UTC day giving him another 2 SOTA points. My final contact on 15m was with Mike VK5SF from the northern suburbs of Adelaide, with a very very strong signal. It was at this time that Stuart VK5STU arrived at the summit, and this was soon followed by Nigel VK5NIG. We stopped briefly for a chat, and Stuart and Nigel then commenced erecting their antennas. They both use ropes and weights to get their antennas high up into the trees, whereas I use the squid pole. Above:- Stuart VK5STU, in the process of erecting one of his antennas. Whilst Stuart and Nigel were busy, I tried 20m for any SOTA chasers after the UTC rollover. I called CQ on 14.305 and this was answered by Andrew VK2MWP, followed by Brett, and then Murray VK7ZMS. Signals were well down compared to normal, and I worked a further 10 stations after Murray, from VK1, VK2, VK4, VK6, and VK7. The strongest signal was from my old mate Ted VK6NTE in Western Australia. I also spoke again with Gerard on VK2/ IL-017 and VKFF-0362. I was actually in the process of connecting the links on the dipole when Gerard called in. So, with one link in, and the dipole laying on the ground, it was a scramble to get the squid pole back up in the area before Gerard disappeared. It was great to get another Summit to Summit contact with Gerard on a 2nd band. Gerard and I were receiving each other a little weaker here on 20m compared to 15m (5/3 sent and 5/4 received). Stuart and Nigel also took a break and worked Gerard. I then headed to 40m for the last time, to see if I could give some of the SOTA chasers a few extra points for the new UTC day. I called CQ again on 7.090 and this was answered by Adrian VK5FANA on the Yorke Peninsula. Although Adrian was not his normal 5/9, he was still very readable, as the noise floor on the summit was incredibly low. I worked a further 5 stations and was just about to go QRT when I was called by Tony AX3VTH who was activating the Yarrawonga Regional Park, VKFF-0981. Tony was not his normal booming 5/9 signal, but this was just due to poor band conditions. I packed up my gear, and then sat down under the shade of some gum trees for a chat and some ‘war stories’ with Stuart and Nigel, who worked the occasional station, including Richard VK5ZRY who was portable in the Roonka Conservation Park, VKFF-1090. Being a park tragic, I couldn’t help myself, and worked Richard on Nigel’s gear. I then left the boys to play radio, and I headed home for lunch. I had a total of 82 contacts in the log, despite band conditions being rather average. Here is a short video which Stuart VK5STU put together…….. 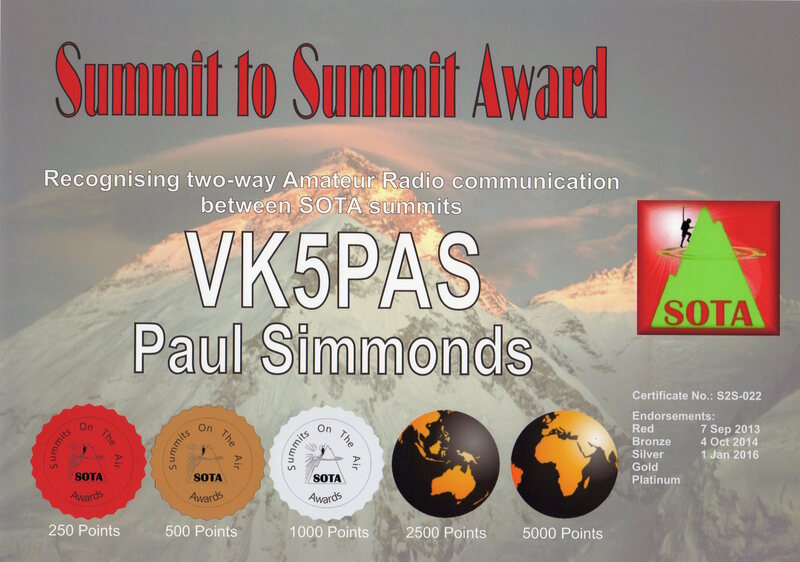 I also received my latest Summit to Summit (S2S) Award for the Summits on the Air (SOTA) program. It is for the acrual of 1000 S2S points. Whilst I was away in Swan Hill, I received the following award certificate via email for the World Wide Flora Fauna (WWFF) program. The certificate is issued by the Silesian Radio Amateur Group, to celebrate the activation of the 500th Polish WWFF protected area. Many thanks to Peter SO9DXX, the award manager and art designer.